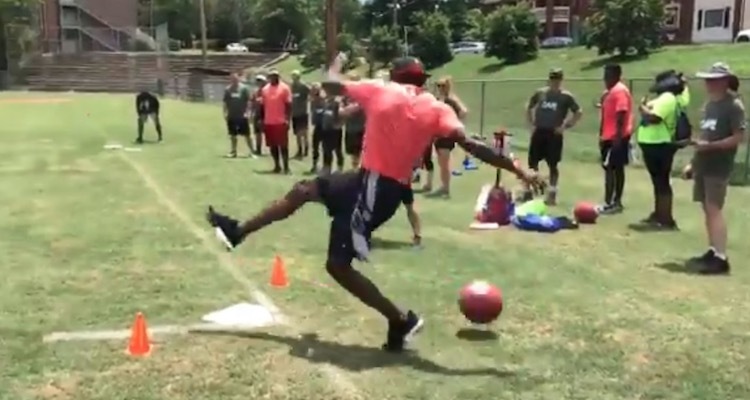 However, it tuns out that, while Julio may be one of best people on the planet at catching balls, the dude cannot kick for sh*t.
Cam Newton held his annual charity kickball tournament in Charlotte on Friday. While Julio Jones was just one of many celebrities and athletes in attendance, he’s really the only one anybody is talking about thanks to one embarrassing whiff. Of course, we have no idea what happened next. Julio might have kicked the ball 300 yards and rounded the bases twice. All we know for sure is that, for one split second, an athlete who’s skillset is worth a hundred million dollars looked like a regular dude. And—I gotta be honest—it makes me feel a little bit better about myself.